I’ve been hearing about this light for quite some time now, with the consensus being that this is a fantastic light at a great price (especially for a SureFire light). There are two models of this light, the Plus and the standard. Both take a AAA battery to power them, but the size and output varies. The standard Titan is shorter by a fair amount and has a maximum output of 125 lumens — which is about all you need for most scenarios where you would be using a light this small. It has two modes at 15 lumens and 125 lumens and is only $55. The Titan Plus is an all together different beast. It uses the same AAA power source but pushes out 300 lumens with modes of 15/75/300 for the power output. 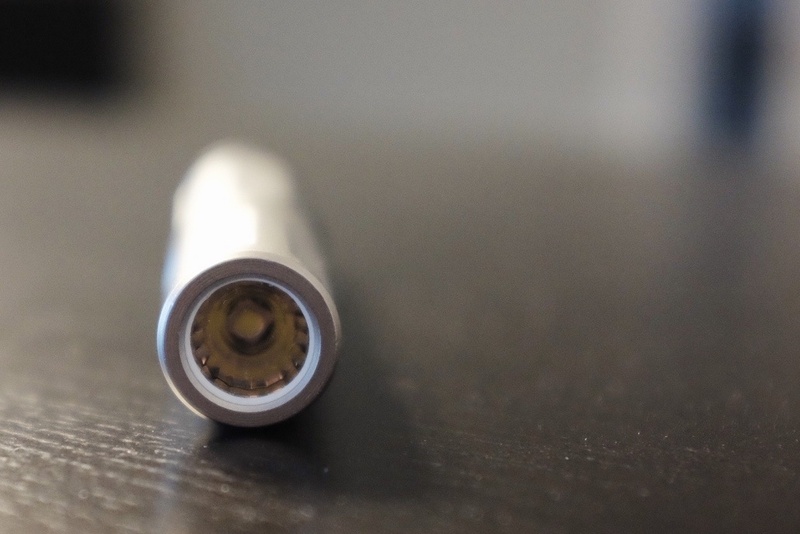 Though it is longer than the Titan, it is barely longer and the added output is worth paying $81 for the light. This light is an everyday carry (EDC) light, which is made to always be on your person, largely in your pocket. Because of this there are two options for aiding in this type of carry. The first is an eyelet at the back of the light which allows for you to attach a lanyard or something of that nature to the light. 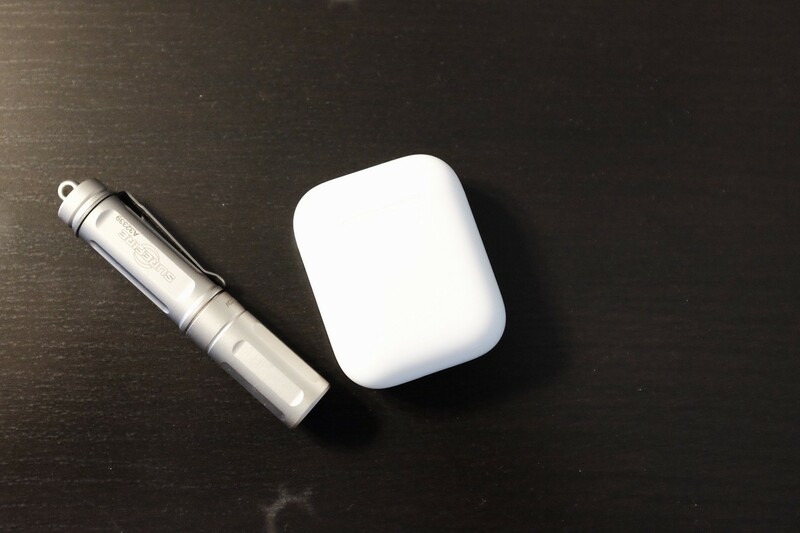 The second is a clip on the body of the light for carrying it on the edge of your pants pocket. Neither are very good options. The lanyard slot is mostly pointless as it adds enough bulk that you might as well not have it in your pocket — and the light is too large to attach to your key ring. The clip is very nice, robust, and generally well done, but clips absolutely destroy your pant pocket and thus I don’t use them. That said, I carry all my lights loose in my pocket. This light despite being a bit longer than the light I had been carrying is fantastic. It is svelte enough both in weight and shape that it really is not an issue to carry in my pocket at all. I would much prefer SureFire to remove the lanyard eyelet and instead make the end flat so that the light can stand on its tail. Frankly, this light to far too bright for many of the circumstances I use my lights for the most — so instead I need to break this section into two sections. The most common use for my flashlights is when everyone is in bed and I need to check something. Perhaps there was a noise downstairs, or a kid was crying — or maybe it’s particularly dark and I need to find my way to the bathroom. Either way, I tend to use a flashlight with a so called ‘moonlight’ mode where the output is below 2 lumens (my go to is 0.5 lumens). This allows me to move about without destroying my night vision, or disturbing the sleep of anyone — even if the light is shined in their face. The Titan Plus at 15 lumens on the bottom end is far too bright for this use. 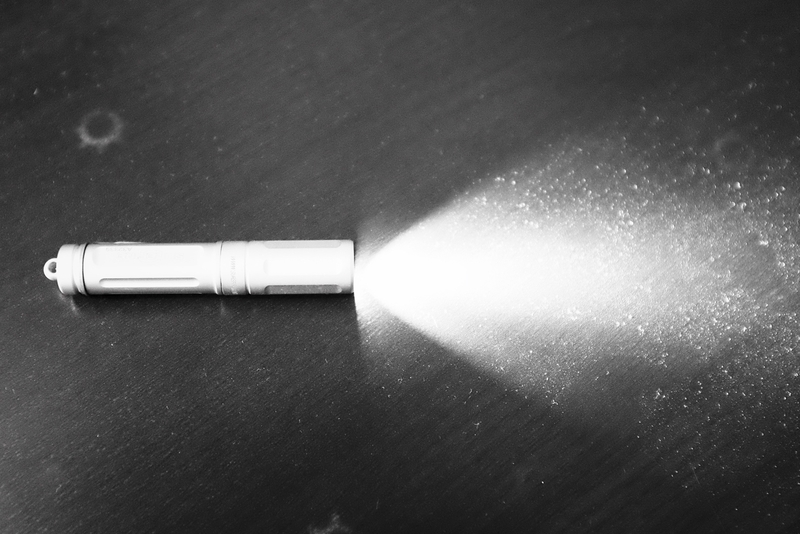 It’s not the intended use of this flashlight — or really any SureFire — but it did limit my testing because of the brightness. It’s too bright! A far more uncommon use, though seemingly what most EDCers carry a light for, is for those scenarios when you really need a bunch of light. Emergency situations being the go to reason, but also for impromptu repairs, or looking for that lost item under the car seat. For these scenarios this light has amazing output for such a small package. You really want the light to be bright, and this offers great modes. 15 lumens is great for a working light without worry of blinding yourself. While 75 offers a nice step up when you really need to figure things out. 300 is far bright enough to overpower other light sources when you are inspecting or looking for items — or you really need to see what is in the darkness of the night. This all means: I take this light religiously now when I travel. It is the best of all worlds in a tiny package. Impressive. The one thing I wasn’t sure of with this light was the operation of it. I much prefer tail press lights, but this is a twist light (twist the head of the light to turn it on). The advantage of this system is that it doesn’t tend to drain your battery at all, nor will it accidentally turn on. The disadvantage really comes in cycling the modes, and it requires more nimble fingers. But, it has yet to be an issue for me. Primarily because the base output is to bright, that you will not be fumbling for more power from the outset — whereas as a base moonlight mode can leave you wondering if you even turned it on in some situations. I’ve found the pocket clip to help a lot with grip when turning on the light — as well as keeping it from rolling off tables. I wanted to remove it, but after using it, I realized that would be a loss for me. The light being output is typical SureFire — it is very smooth with a solid hotspot in the middle. This light has a fairly wide beam, which is great for a little light for walking at night, or looking in tight spots — but you are not going to be lighting up stuff far away with it. I think SureFire struck an ideal balance with this light for what its intended use is. The only draw back to usability is the color rendition — the light is very cool (as are most SureFire lights). This doesn’t bother me for how I use the light, but coming from high CRI lights you will notice it. And if you don’t know what I am talking about, then you’ll think this light looks great. One big need I had was repacking my travel lights when I fly. The SureFire Backup is great, but bulky to travel with and overkill for almost everything. 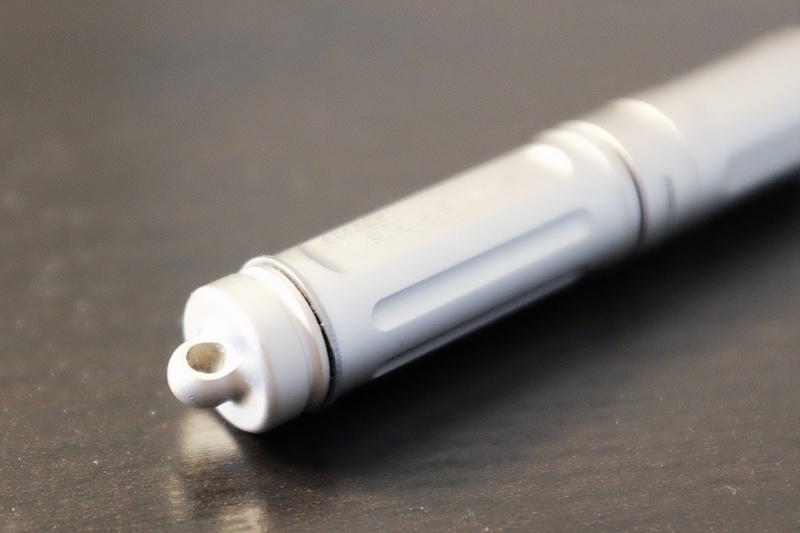 The Reylight I was using kept getting me stopped at TSA, and the Massdrop AAA while great, has a lower output that I never felt worked great for travel. 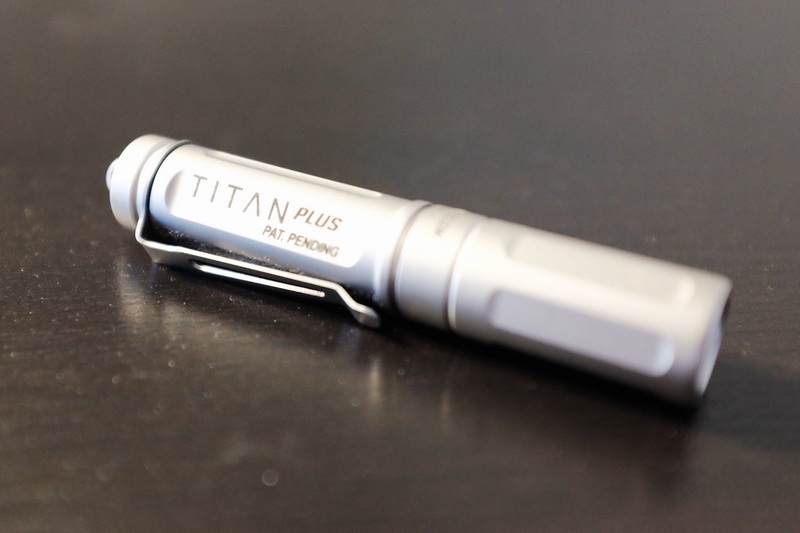 The Titan Plus is small, durable, functional, and bright — it checks every box. And it also doesn’t get you stopped by TSA, another bonus. I don’t think I’ll keep carrying this light as my daily light, however it will be the light I always travel with. And if I didn’t already have the Massdrop AAA light (which is really cheap) I would be more than happy to use the Titan Plus as my daily light as well. This light gets a lot of praise — it’s all warranted. A great light, well made, amazing warranty, awesome output, for a truly low (for flashlights) price.